James S. Hirsch dives into some of the more disturbing details behind the wrongful conviction of middleweight boxer Rubin “Hurricane” Carter. Carter was wrongfully convicted of triple murder and spent almost 20 years in jail. Carter was understandably outraged but he used his time in jail to learn and grow into a more caring and complete person. You can make the most of every single situation. If Carter can spend nearly 20 years in jail and learn from that situation, it is hard to imagine a situation where this is not possible. In a bit of a strange turn of events, a Canadian commune lead by Lisa, made it their mission to help Carter get out of prison. Lisa was the leader of the commune and a very determined, controlling leader. For a time Carter received a lot of publicity calling for his freedom. For example, the song Hurricane by Bob Dylan, was Dylan’s way of supporting Carter’s fight for freedom. Carter’s self-transformation during his time in jail is inspiring. He dealt with his problems resolutely and while he was often distant and cold to those closest to him, he was able to make the most of a terrible situation. 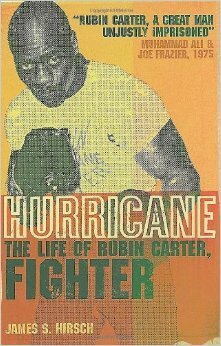 This entry was posted in Books and tagged Biography, Boxing, James S. Hirsch, Race, Rubin "Hurricane" Carter on May 4, 2015 by Blas.